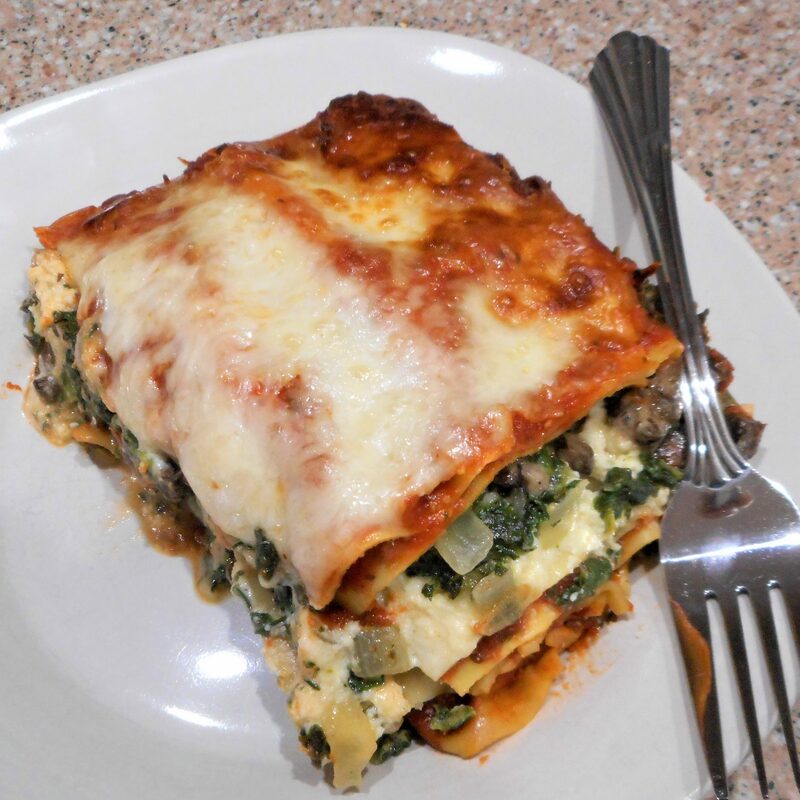 What makes this spinach lasagna “Super” is the way it is layered and the addition of a layer of mushrooms that have been cooked in just a little cream. I make the lasagna in two loaf pans so I can freeze one. If you plan to serve it all in one meal, a 7×11″ baking dish or 2 quart baking dish will work. The fillings can be made ahead and refrigerated. Use hot marinara for assembly to speed the baking time. 2. Defrost the spinach and squeeze it dry. Set aside in a medium bowl. 3. In a small non-stick skillet, heat the olive oil. Add the onions and saute until they begin to soften. Stir in the garlic, red pepper flakes, and salt. Cook and stir for just a minute, then remove from the heat to cool. 4. Stir the egg into the spinach, then add the cooled onion mixture, mixing well. 6. In another bowl, mix together the ricotta and egg. Stir in the Parmesan and parsley. Set aside. 8. In the same skillet, heat another tsp of olive oil over medium heat. Add half the mushrooms and toss them quickly around the pan to distribute the oil. Add the remaining mushrooms and again toss quickly around the pan until the mushrooms just begin to soften. Add the flour, cook and stir for a minute or two. Stir in the cream, salt, and pepper. Bring the mixture to a boil and cook, stirring frequently until the sauce begins to reduce and thicken. Remove from the heat and set aside. 10. Preheat the oven to 350°. Lightly grease or spray the baking dish(s). 11. Spread 1/3rd of the marinara sauce in the bottom of the dish, about 1 cup for a singe dish, or 1/2 cup each for loaf pans..
12. Layer in 2 noodles. If using loaf pans, cut the noodles crosswise into thirds and place them width wise, 3 pieces in each pan. 13. Spread 1/2 of the cheese mixture, about 1 cup or 1/2 cup each for 2 pans, evenly over the first layer of noodles. Add 1/2 of the spinach, then mushrooms and top with another layer of noodles. 14. Next add another third of the sauce, noodles, cheese, spinach, mushrooms, and the last noodles. 15. Spread the remaining sauce over the top layer of noodles and sprinkle with the shredded Italian cheese blend. 16. 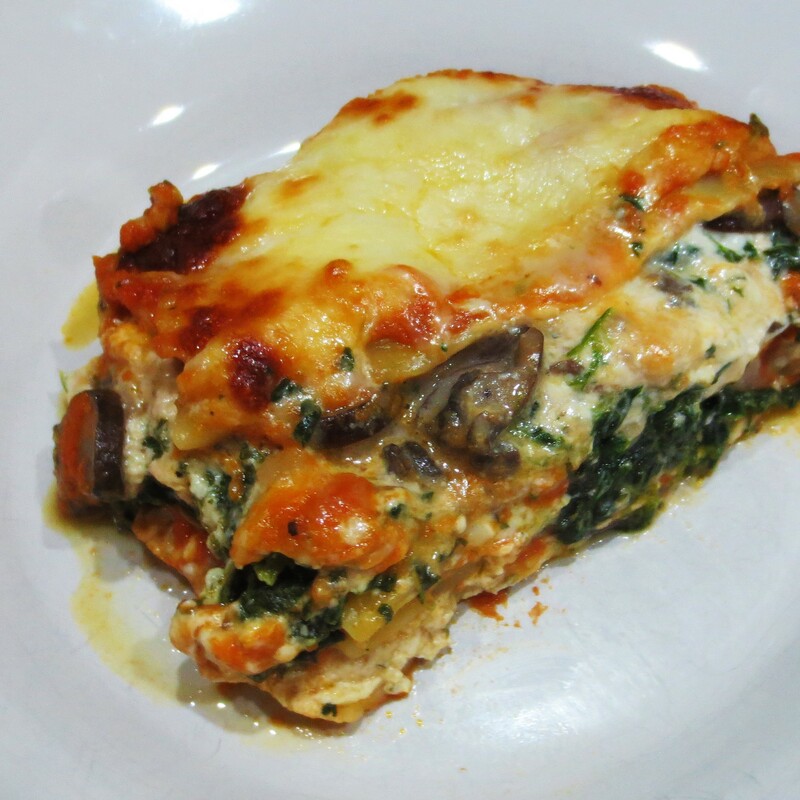 Cover the lasagna with foil and bake for 30 minutes, then check it’s progress. This is not a “bubbly” dish, so if the top cheese is evenly melted it’s time to remove the foil. Bake about 10 minutes longer to lightly brown the cheese. 17. Let stand 5 minutes before serving.